Last November 20, 2010, I gave a talk at the Rotary Club of Makati San Antonio (RI District 3830), held during their tree planting activity in Tanauan, Batangas province. The audience composed of club members, some of their family members, representatives from their sister rotary clubs, and their Interact club. My presentation was entitled Climate, Carbon and Cancun: The Truth Behind Alarmism. It contains 47 powerpoint slides, showing the common claims by the warmers, then I showed actual data until about 1 day before the event. 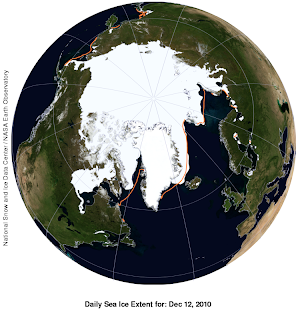 A persistent claim by the warmers to keep scaring and fooling the public is that "Arctic ice are melting at an alarming rate, that we might see an ice-free Arctic within 10 yrs or less. The melted ice in the Arctic, Greenland and Antarctica will cause sea levels to rise at an alarming rate, submerging Maldives and other low-lying islands, countries and cities." When the Arctic or Antarctica ice is melting simply because it is melting period (approaching summer in either the Northern or Southern Hemisphere), we read a number of newspaper reports and TV coverage about it. When the ice in either hemisphere is growing -- ice there are simply growing, melting, growing, melting, every year -- we hear nothing from the warmist media. Among the pictures I showed in that paper is a satellite picture of the Arctic ice area. Here's an updated picture as of December 12, 2010. The area contains about 11 million sq. kms. of ice as of two days ago. The ice is growing further after reaching the summer time low of less than 5 million sq. kms. of ice. Graph source is http://wattsupwiththat.com/reference-pages/sea-ice-page/. When the warmers say, explicitly or implicitly, that sea ice in the Arctic and/or Antarctica is melting continiously, they are simply lying. They should qualify that sea ice there is melting. Then growing. Then melting. Then growing. Every year. One big scary and alarmist issue raised by this camp is that man-made warming is "unequivocal" and "irreversible" unless we agree to their political agenda of more environmental regulations and more carbon taxation. That planet Earth's average temperature will rise up to 4.0 C by 2100, with the worst case scenario of up to 6.4 C temperature rise just 90 years from now! The rabid greens and climate bureaucrats are clear with their political agenda: more environmental regulations, more energy taxation, creating more and bigger climate bureaucracies, endless global climate meetings and junkets. I thanked Club Pres. Chaie (left in this picture) for the opportunity to discuss the topic with their clubmates and friends that day. I also thanked my classmate, Past President of their club, Luz Reyes (right), for endorsing me to Pres. Chaie. Rabid environmentalism and too much climate bureaucratism should be creating their own internal contradictions. That is why despite their two big attempts in Copenhagen meeting last year and Cancun meeting this month, they do not succeed.